Dodgers pitcher Hiroki Kuroda has been placed on the 15-day disabled list with a strained left oblique muscle, and Eric Stults will be recalled from Triple-A Albuquerque to start Saturday for the Dodgers against the Diamondbacks. Let's hope this is not a season long problem. "It isn't pain, it's tightness in a very specific area where we worry about for pitchers, on the opposite side," Conte said. "The key is we think it's mild, but it can be serious and take six to eight weeks. We think we caught this early." I hope you all have a safe weekend. Please do not drink and drive. In a strange way, I feel honored that Nick got his one win against the White Sox. I feel sad that he will never get the chance to win his second game. Nick left behind a 1-0 lifetime record. We'll never get to see Nick blossom into the pitcher that he was destined to be. I have no respect for these vultures. What’s even worse is the “fans” who have unloaded all their in-person autographs trying to make a quick buck. So this is how collectors repay Nick’s generosity? By unloading everything you own to make some quick cash? Matthew Barry writes that in light of recent events we should all be mindful of what we drink. The Stanley Cup playoffs are less than a week away. There will be parties, there will be drinking. I'm not asking you to stop. I certainly love a cold beer or two while watching the games or even at Staples Center before the game. But if someone asks "you want another one? ", think about it. If I may speak for every member of the Dodger organization, our heartfelt and deepest sympathies to the mother and family of Nick Adenhart, and to every member in the Angels organization, for the untimely accident and death of young Nick last night at the tender age of twenty-two. Nick, from Maryland, had pitched six scoreless innings and was in a car with three friends, and a driver apparently went through a red light and T-boned the car, killing three of the four, including Nick, and one other member is in critical condition. And if there is one thing I’ve learned in all my years — and I haven’t learned much — but the one thing I’ve learned: Don’t even waste your time trying to figure out life. Ground ball through for Andre Ethier, and life continues for those who still have it. And with a leadoff single, Russell Martin will be coming up. But I would say, it wouldn’t be a bad idea to take a moment and say a prayer in memory for Nick, especially for his parents. What a shock to lose a twenty-two-year-old. Andre Ethier at first base, Russell Martin the batter, James Loney on deck, and the Dodgers try to strike in the second inning against Kevin Correia. Mile High Card Company auction recently concluded a great auction that included some very rare cards and memorabilia. First, I'll start off with a Dodger related card of one of the scarcest 1950's issued region sets made. 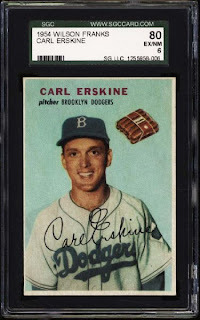 Below is a 1954 Wilson Franks card of Carl Erskine. These cards are very difficult to find, especially in this condition. The card sold at a healthy price of $775.00. Now, on to something that truly boggles the mind. Mile High had the honor of auctioning off one of the rarest Topps test issues ever produced. Below is possibly the only complete master set of 1968 Topps All Star Player Plaks. 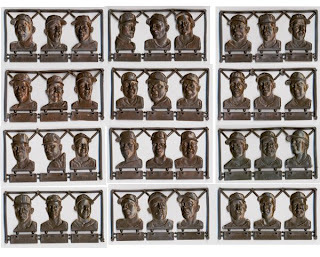 Last year a huge lot of these rare plastic bust were found hidden in a small bucket inside the garage of a former Topps employee. They were discarded and forgotten about. Acting on a phone call from a couple outside of Scranton, Pennsylvania, Brian Drent, founder and President of Mile High Card Company, recently traveled to The Topps Company's former hometown to examine what he'd been told was a pile of plastic baseball parts produced sometime in the late '60s. The owner's mother had worked at the Topps factory for a number of years and would occasionally treat the neighborhood kids to free candy and miscut cards. She also had permission to take home any of the failed test issues, as she did with an armful of Topps Plaks wax packs. She quickly learned, however, what Topps management had already concluded, that what kids wanted most was cards and candy, that you couldn't really flip a plastic bust, and that they had no negotiable street value. So she put them in a bucket on a shelf in her garage where they sat for the next forty years. As proof of it's scarcity it sold for an amazing $55,612.00. 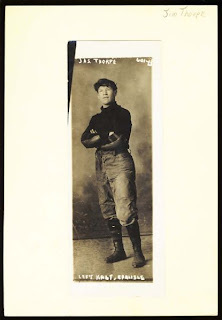 Here is a Type 1 vintage photograph of a very young Jim Thorpe. One of the single greatest athletes of all time, Thorpe won Olympic gold medals in both the pentathlon and decathlon, excelled in football (his favorite sport) at both the collegiate and professional levels, played professional baseball and basketball, collegiate lacrosse, and even ballroom dancing, winning the 1912 intercollegiate ballroom championship. On the gridiron, he excelled in almost every position, routinely scoring all of his team's points as running back, defensive back, placekicker, and punter. His athletic career, according to legend, began in 1907 when he walked past Pop Warner's track practice and beat the team's best high jumper with a spontaneous 5'9" leap while still in his street clothes. Pop Warner immediately took his new track star under his wing, discouraging Jim from playing the comparatively violent game of football. Thorpe, however, eventually convinced Warner to let him run some plays against the team's defense, and the rest, as they say, is history.